Started in November 2011 our 'Ladies Dining Club' has run every month since and is going from strength to strength. 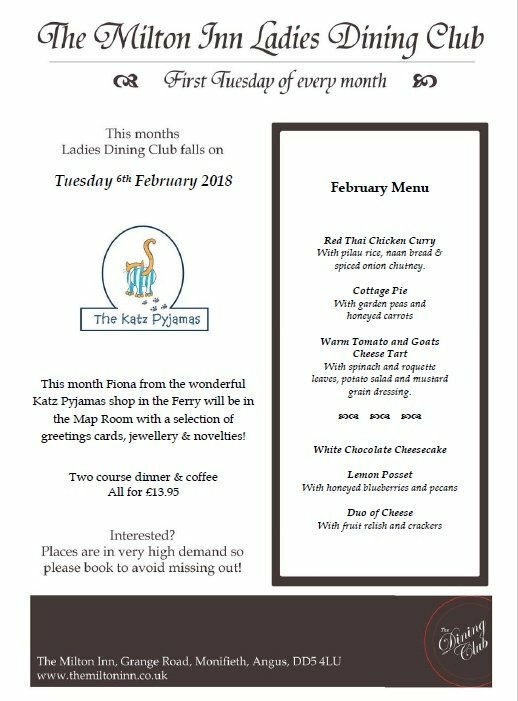 Every month we have a specially designed two course menu for ladies and something different in our 'shop' in the Map Room from Avon to Mrs Tilly's confectionary. It's great opportunity for all you ladies to get out with your girlfriends, have a glass of wine, a catch up and buy some nice treats to take home. Our festive drinks fair came about as we had the idea of showcasing some of the great products we stock and have available to us. Why go from shop to shop when we bring all the elements together? You can get all your festive drinks in one place, in one night. We open on a Monday night, which we are normally closed, and this enabled us to have the whole place set up for the fair. We offer a selection of trade only wines through our own supplier, 5 litre mini casks from local breweries and a selection of spirits and pre-mixed cocktails from Eden Mill, St. Andrews and our local distillery, Ogilvy. On the night everything on show is available to sample, you then place your order, pay for it, and then we deliver it to your door the week before Christmas!